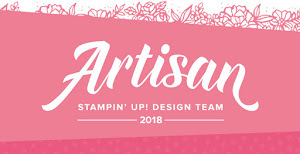 Stampin’ Blends and Crumb Cake! Yum! 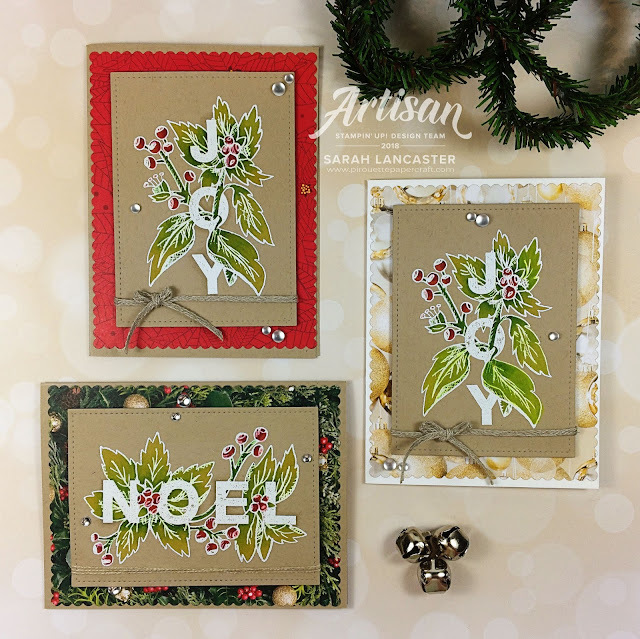 Hello, my name is Sarah Lancaster and today I am sharing a set of Christmas cards created using just one stamp set and my Stampin’ Blends! My creations today have used the Joy and Noel Stamp Set (item 147839). 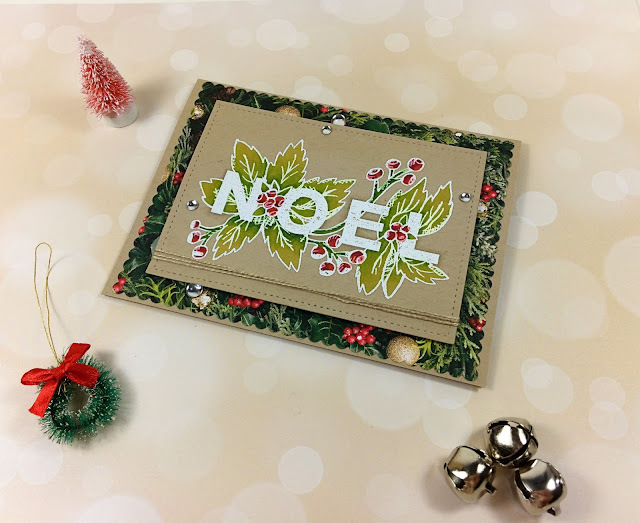 This stamp set is absolutely perfect for simple, stunning cards, so don’t worry if you are on a tight budget, this is the stamp set for you this Christmas. To begin I took some Crumb Cake A4 cardstock (item 121685) and covered my stamp with Versamark Ink (item 102283). To ensure that I got a perfect image I made sure to use my Embossing Buddy (item 103083) to swipe my cardstock to remove any static and I used my Stamparatus (item 148187). I like to use my Stamparatus for bigger stamps to ensure that if I do miss an area with ink I can easily restamp that part and everything aligns just perfectly. Then I covered my stamped image with White Stampin’ Emboss Powder (item 109132) and heated my image with my Heat Tool (item 129055 EU plug). 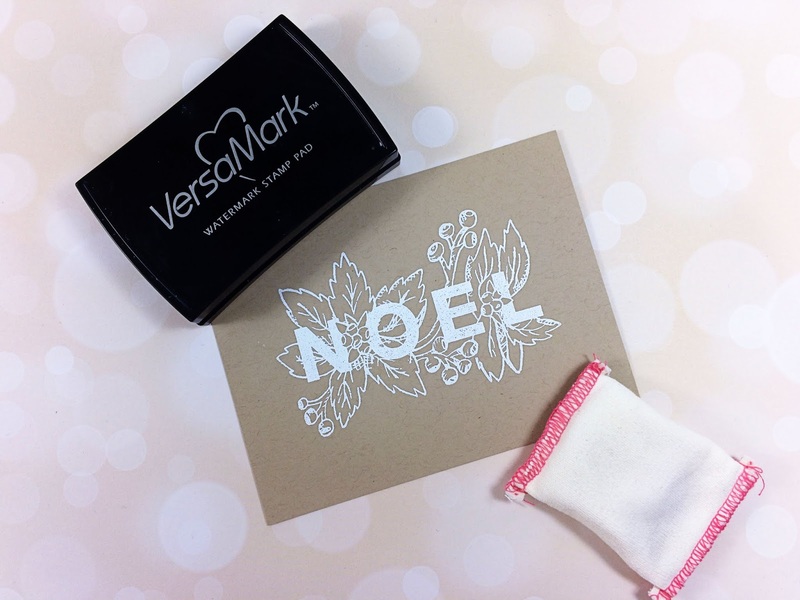 Now it’s the turn of the Stampin’ Write Markers! These will produce slightly different tones and hues on Crumb Cake cardstock and I love the effect! I have used my greens and reds and I was careful to avoid the white heat embossed areas. The colours I chose were Granny Apple Green Combo Pack (item 147274), Soft Sea Foam Combo Pack (item 148059) and Old Olive Combo Pack (item 144597) for the greens. For the reds I took Poppy Parade Combo Pack (item 147275) and Cherry Cobbler Combo Pack (item 144598). I also created “highlight” areas around the individual letters using Crumb Cake Light (item 144582) and the Colour Lifter (item 144608). This really makes the words pop out from the coloured background. 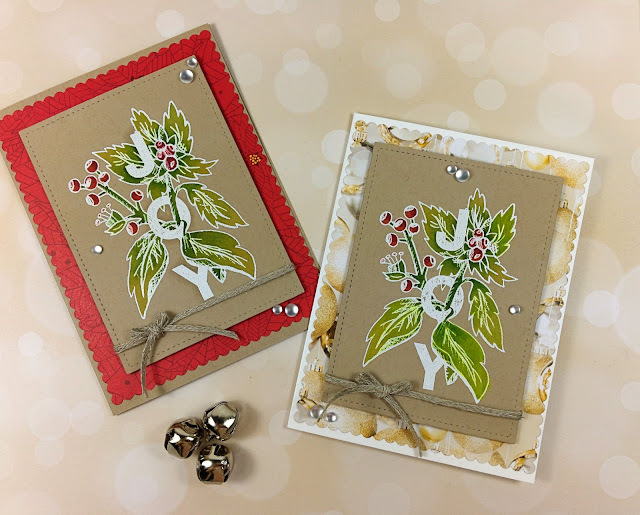 I wanted to keep my cards very simple so that the emphasis was on the coloured stamped image so I chose neutral embellishments; the Braided Linen Trim (item 147808), Linen Thread (item 104199) and the Frosted and Clear Epoxy Droplets (item 147801). I added Stampin’ Dimensionals (item 104430) behind my Crumb Cark stamped panel to add height and to hide the ends of my ribbon and twine. So, one simple stamp set which you may have overlooked in the Occasions Catalogue can create beautifully coloured, individual Christmas cards. 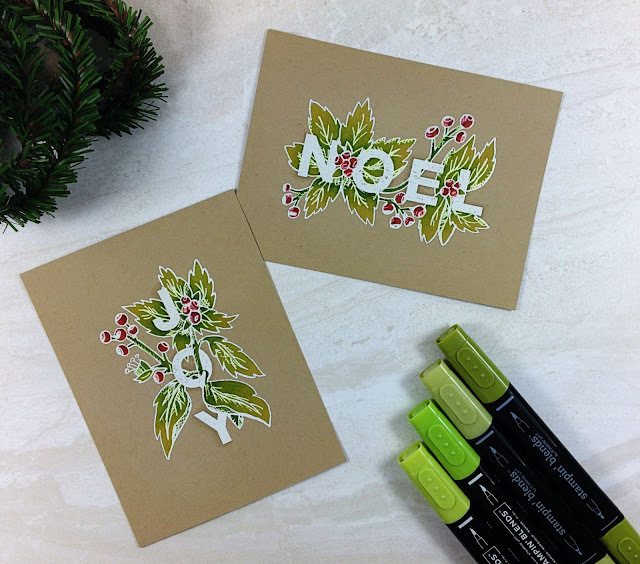 I challenge you to give this technique of colouring on Crumb Cake cardstock a go – you will love the results, I’m sure!